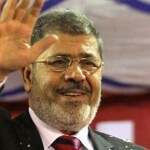 Egypt: "President Morsi starts acting - and regains Power"
Egypt’s new president Morsi has ordered the retirement of two of the country’s top generals - a surprise move that touches the balance of power and that is considered as “revolutionary” by the Egyptian public, writes eufrika.org correspondent Abdallah Farid. After the deadly attack on the Egyptian military forces on Sinai on 5th of August which ended in 16 Egyptian soldiers and 6 Egyptian officers being killed near Egypt’s borders with Israel and the Gaza Strip, Egypt’s President Mohamed Morsi has started taking severe actions regarding changing the head of the army. Morsi started his changes on Sunday by dismissing Field Marshal Hussein Tantawi, who ruled Egypt for more than a year after the revolution that toppled former president Hosni Mubarak. Armed forces chief of staff Sami Anan was also retired, state television said a week after the Sinai’s attack. However, the Egyptian press on Monday described Morsi’s move as “revolutionary”, with some saying it was aimed at ending the power of the Supreme Council of the Armed Forces SCAF (the Supreme Council of the Armed Forces). I never intended, through my decisions, to marginalize or be unjust toward anyone, but rather to act so that we advance toward a better future, with a new generation, long-awaited new blood”, Morsi said in a speech at Cairo’s al-Azhar mosque late on Sunday. His surprise announcements marked a new twist in the uneasy relationship between Morsi and the army, testing the balance of power between the first civilian president in Egypt’s history and a military that had moved to limit his power. Thousands of Islamist supporters celebrated the announcement Sunday night in Cairo’s Tahrir square, which had played home to the protests that ousted Mubarak. “The people support the president’s decision,” the crowd chanted. Others mocked Tantawi’s departure, presented officially as a retirement. “Marshal, tell the truth, did Morsi fire you?” they said. The veteran army leader – who had served as Mubarak’s defense minister for two decades and headed the country after the strongman’s overthrow, until he handed power to Morsi on June 30 – was replaced by Abdel Fattah al-Sissi. Tantawi and Anan, both recipients of the Greatest Nile Collar, Egypt’s most prestigious award, had been retained as presidential advisors. Morsi also amended the interim constitution to deny the military any role in public policy-making, the budget and legislation, and the right to pick a constituent assembly drafting a permanent constitution for post-Mubarak Egypt. “The president has decided to annul the constitutional declaration adopted on June 17″ by the SCAF, headed by Tantawi, his spokesman said. Last Wednesday, the president had ordered spy chief Muraf Muwafi to retire in a reshuffle of military and intelligence ranks after the attack which killed 16 soldiers near Egypt’s borders with Israel and the Gaza Strip. He also sacked the governor of North Sinai, Abdel Wahab Mabruk. Islamists scored a crushing victory in Egyptian parliamentary elections that were held in three stages from November last year, with the Muslim Brotherhood dominating the lower house. Some are anxious that Egypt is moving from an authoritarian state to an Islamic state. Others see what they describe as tell-tale signs of another authoritarian regime in the making. The Brotherhood-dominated upper house of parliament, which was not dissolved, last week replaced many of the editors of 50 state-owned publications with journalists known to be sympathetic to the group. Also last week, authorities shut down an independent television station whose owner and chief presenter, Tawfik Okasha, has gained popularity for his on-air rants against Morsi. Last week, he called for Morsi to be killed. On Monday, Egypt’s top prosecutor referred Okasha along with the editor of an independent daily newspaper to a criminal court for trial on charges of incitement. Last week, a crowd of suspected Brotherhood supporters stormed a TV complex in a suburb west of Cairo, attacking journalists and smashing cars to punish media critics of Morsi. Following a series of recent attacks on Brotherhood offices, the group has vowed to protect its headquarters against possible violence during anti-Morsi protests scheduled for Aug. 24 in Cairo. The vow was seen by critics as an acknowledgment by the Brotherhood that it would resort to violence in the face of threats.